was founded by Irish settlers who arrived from the north Cork area from 1823 to 1825. 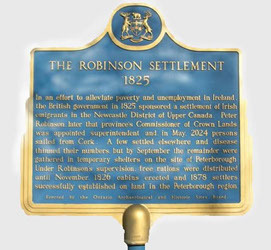 Peterborough was named by the settlers in honour of Peter Robinson who organised the emigration so successfully. Over 2,000 settlers recieved 60 hectares (about 148 acres) of land, flour and meat, a cow, an axe, a saw, an iron pot, a frying pan, seed potatoes and corn. 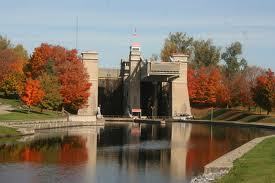 More than 50,000 immigrants arrived in Kingston in 1847, a city with a population of only 10,000. Over 4,300 Irish were hospitalised in Kingston and of those, 1,400 died from infection. In 1966, the remains of typhus victims buried on the grounds of Kingston General Hospital were moved to St. Mary's Cemetery. This mass gravesite was marked with the Angel of Mercy monument since 1894 and this was also transferred. In 1998, a small park at Ontario and West streets was named in honour of the Irish victims, Án Gorta Mór Park. 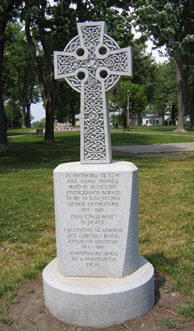 A Celtic Cross Memorial was installed in the park the next year, and in 2002, another Celtic Cross Memorial was unveiled in McBurney Park (also known as Skeleton Park). McBurney Park was one of the burial grounds for local citizens, including those who fell victim to typhus. In honour of the Irish immigrants in Kingston and those who tragically ended their journey there, annual ceremonies are held by the Kingston Irish Famine Commemorative Association along with the Kingston Irish Folk Club and others. 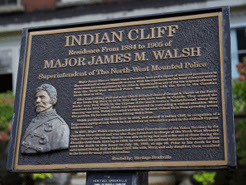 James Morrow Walsh, (22 May 1840 – 25 July 1905) was a North-West Mounted Police (NWMP) officer and the first Commissioner of the Yukon Territory. 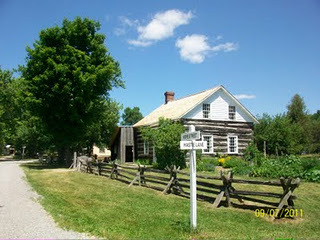 He was born in Prescott, Ontario, to Irish settlers Louis and Margaret Walsh. 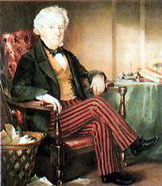 At age 22, James Walsh graduated from Kingston Military School (now Kingston Military College), where he met Col. French from Roscommon, who was head of the School of Gunnery. At age 24 he ran the St. Lawrence River rapids from Prescott to Montreal with a friend and at age 26 Walsh organized the 4th Hussars and ironically fought during the Fenian Raids. Walsh developed a strong friendship with the famous Sioux leader Sitting Bull and was responsible for keeping peace in the region. 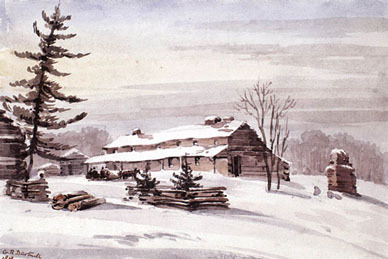 Fort Walsh, Saskatchewan and Mount Walsh, a mountain peak in in the Yukon are named after him. London’s first colour feature film was called Talbot of Canada, about the life of Col. Thomas Talbot of the Talbot family of Malahide Castle. it was shot on the shores of Lake Erie. Much of the original film, and all of the audio, was lost in a fire, but what remained was reconstructed by Chris Doty and a team of voice artists. There is a copy of Talbot of Canada available at the London Public Library.